Position : Tips - How to fix Windows error code 0x80070643? How to fix Windows error code 0x80070643? This page explains symptoms, causes and step-by-step solutions to error code 0x80070643 which happens to Windows update, Microsoft Security essentials and MSI. Besides, this article introduces how to get back lost data from desktop after computer undergoing 0x80070643 error. As Windows user, you may often encounter this error; if you feel uncomfortable with it, you can read through methods in this article to fix it as soon as possible. Windows is very user-friendly operating system used by millions of users across the world and it has to install updates to keep it up to date and repair system vulnerabilities. Microsoft releases system updates from time to times and by default, our operating system has been set to check and install those updates automatically provided that computer is connected to the Internet. Updates fix bugs on current system and improve features. In addition, system updates can be downloaded directly from Microsoft website and installed manually. If you are a Windows user, you will never skip updating Windows to assure your PC safe and good environment. However, Window update can't go well all the time and there are several messages that you may run into during system update, for instance, "Unable to install Windows Update: 0x80070643". This error message can be seen when the .NET framework on your computer has problem, or the update related to MS 2003 components fails. 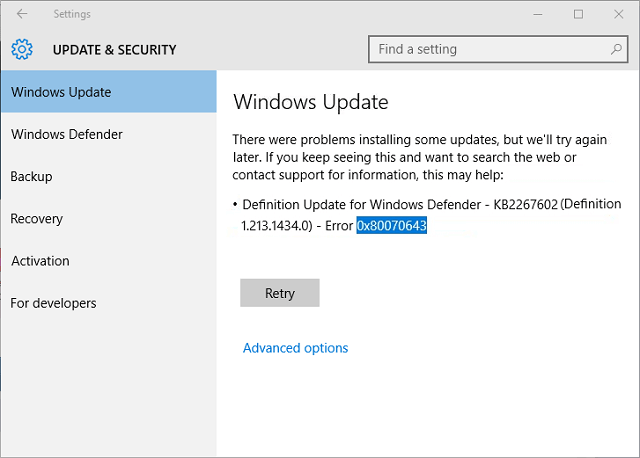 Besides, if your PC is running Windows 10 and you tried to apply KB3122947 update you might also see the same error code "Update for Windows 10 Version 1511 for x64-based Systems (KB3122947) - Error 0x80070643". Solutions to this error vary from person to person on account that it happens to multiple circumstances. Hence, not all solutions listed here will work for your problem, and you need to select one or two of them in line with actual condition. .NET Framework plays an important part in software installation and system updates on all versions of Windows system. And it should be well installed and updated to the latest version in order that other programs can be built, deployed or ran normally. Close all currently running software and click "Start" to select Control Panel. Next click Programs and "Program and Features". Locate Microsoft .NET Framework 4 Client Profile from these listed programs. Select it and click the tab Uninstall/Change which is called Change/Remove in Windows XP. Note: If there is not Microsoft .NET Framework 4 Client Profile on your computer, download it online and install it to update your PC. 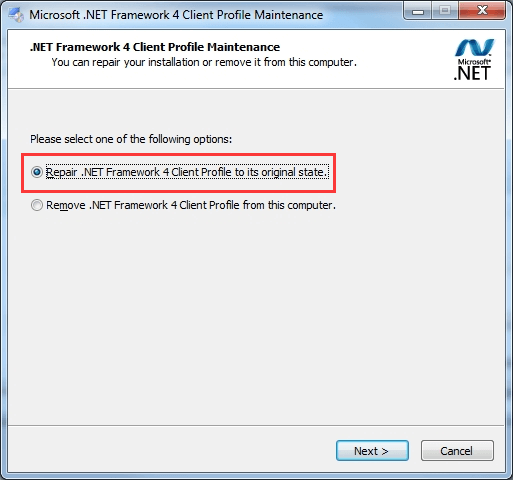 On the pop-up window select Repair .NET Framework 4 Client Profile to its original state and click Next button. Click Finish when repairing process is done and click Restart Now to restart computer. Now you can try to install Windows updates again and see whether the error is eliminated. If the error continues to appear, follow steps in following solutions. Open Control Panel by clicking Start button. Click System and Security and select Windows Update. Click Check for Updates on the left part of the panel to search for available updates for your computer. When Updated are listed, please click "Install updates" to reinstall updates. If your computer installs Microsoft Office 2003 and you have to update some components for it, you might get the error due to the Ose.exe file problem. Here is the remedy. Click Windows + R keys to open Run box. Type services.msc in the searching box and press Enter. Find out and double-click Office Source Engine in the list. Change the Startup type. If the startup type has been disabled, change it to manual. To do this, double-click it and set startup type as Manual and click OK. Try to install Office update once again. If the above steps still don't work, you may have to repair Ose.exe file by copying the original file from Office 2003 CD. The last resort of fix this issue is removing and reinstalling Office 2003. If the error doesn't relate to Office 2003 and these actions will be meaningless. After installing Windows, users starts to install, uninstall or update programs and applications on computer. Besides, various actions and tasks will be done by computer users and system. During the process, there will be corrupted or damaged files appearing in system and causing problem. It is, therefore, suggested to scan and check whether your system contains these files. System file checker comes in handy, as it's capable of scanning and finding out corrupted files and replace them with correct ones. Open Command Prompt. Click Start button and All Programs to locate Accessories where you can find Command Prompt. Right-click it and Run as administrator. Type sfc/scannow in the Command Prompt and press Enter. Then it starts to scan and repair corrupted system files. You just need to wait for this process to complete. When the repairing is done without reporting any error you can try to run Windows update again. If he process reports that some corrupted files can't be repaired, you'll have to consider a system restore. For some Windows 10 users, this error may appear in this way "Update for Windows 10 for x64-based Systems (KB3081704) - Error 0x80070643", the effective solution to this situation is going to registry and carrying out some simple operations. Open Registry Editor. Click Start button and type regedit in the search box and press Enter key. If you are prompted by UAC (User Account Control), click YES. Browse the registry by following the path: HKEY_LOCAL_MACHINE\SYSTEM\CurrentControlSet\Control\BackupRestore\FilesNotToBackup. If FilesNotToBackup exists, then close the editor. Note: If there is not "FilesNotToBackup" under the path, you need to add it manually. Right-click Backup Restore to select New and click "Key". Next type FilesNotToBackup and press Enter key. Click Start button to type services.msc and press Enter. Scroll down and find out background Intelligent Transfer Service. Double click the service just found and click Start under the General tab. Click Ok to make the setting take effect. If it has been set as Start already, click Stop and then again click Start. "I encountered the error code 0x80070643 when I tried to install Microsoft Security Essentials. Though I had had it installed in my computer before that, it failed to work after I used .net cleanup tool. Then I uninstalled it and wanted to reinstall it. Now, whenever I run the installer of Security Essentials I get the error message ‘An error has prevented Microsoft Security Essentials Installations Wizard from continuing. Please restart your computer and try again. The Microsoft Security Essentials Installation Wizard has returned your computer to its original state. Error Code: 0x80070643'"
The installation and updating of MSE is an easy task, but sometimes you get the error and fail to complete the operation. This section explains how to get rid of the error. Before that I'll list several possible causes of the issue. You might have installed other antivirus software on your computer while you are installing MSE. The error might be the result of leftover files, registry entries and firewall settings from third-partition antivirus software. The Windows installer you are using is not up-to-date. The Windows installer service is not turned on. Run system file checker to repair corrupted system files. 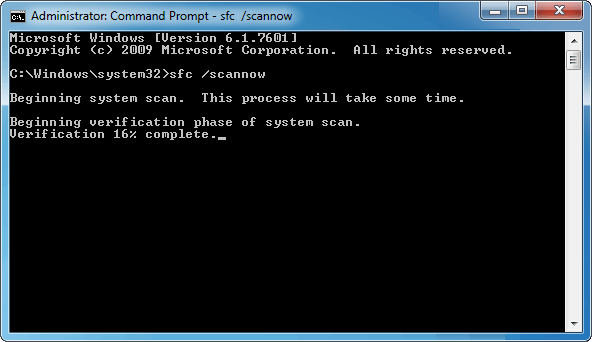 Open Command Prompt and execute command sfc/scannow. Wait for the scan to complete and restart computer. Uninstall other antivirus software. If you have any third-party antivirus software installed on your PC, then remove and uninstall it. Go Control Panel and select Program and Feature, next select Uninstalled a Program. Scroll down to browse the list of programs installed on your PC, locate antivirus such as McAfee, Morton, AVG, etc., and uninstall all of them and reboot computer. Check the Windows installer version if you are Windows XP user. View the path C:\Windows\System32 and right click MSIEXEC.EXE to view Properties. The version number should be at least 3.1 or higher. Windows 7 or Vista users do no need to do this operation, as the default version is 3.1. 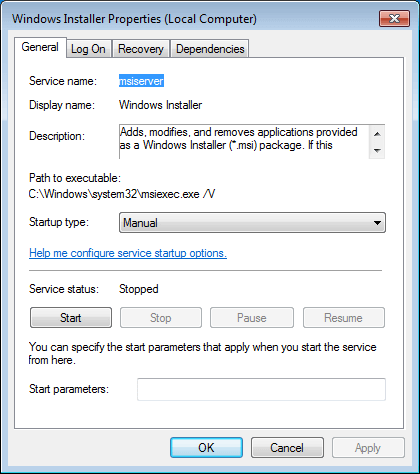 Check whether Windows installer service is running. Press Windows + R keys and type services.msc in the Run box to open Services panel. Find out Windows Installer service and get it started. Start the service. Open Services window by typing service.msc in Run box which can be opened by pressing Windows key and R key from keyboard. Look for Windows installer and view its properties so as to set the Startup type as Start. It's recommended to check whether this service is started or not, because it is the main cause behind the error and the easiest solution. System restore. If there is no effective means, you'll have to perform system restore. This step requires your system have a system backup, otherwise you can't carry out system restore. Hence, it's very helpful to create a system backup when system is in its great status. 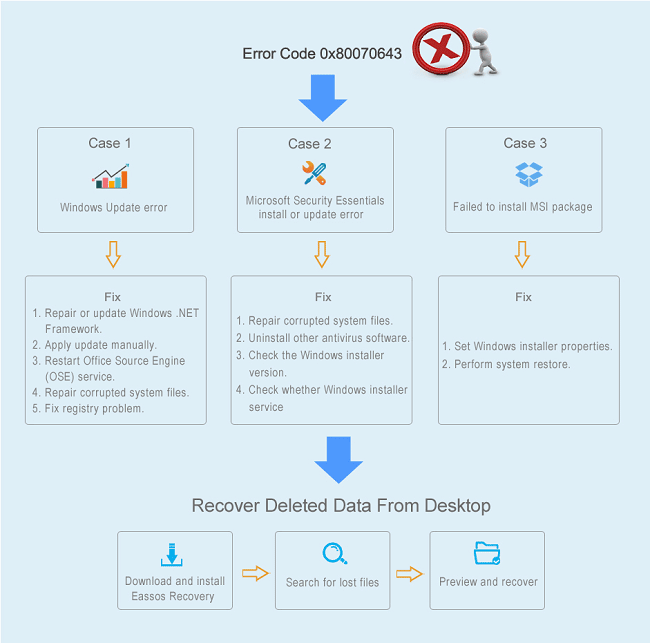 If you are facing Windows error 0x80070643 on your computer, your system is no longer in a good condition and might contain potential serious problem such as data loss, system breakdown. Therefore, you should fix it as soon as possible. In addition, you should know how to recover lost data from system partition or exactly desktop. Many people have the habit of placing files they often edit on desktop, which actually is not a wise action. Desktop belongs to system partition, and any system problem may lead to file loss. If you are troubled by same issue, keep reading to find out resolution. 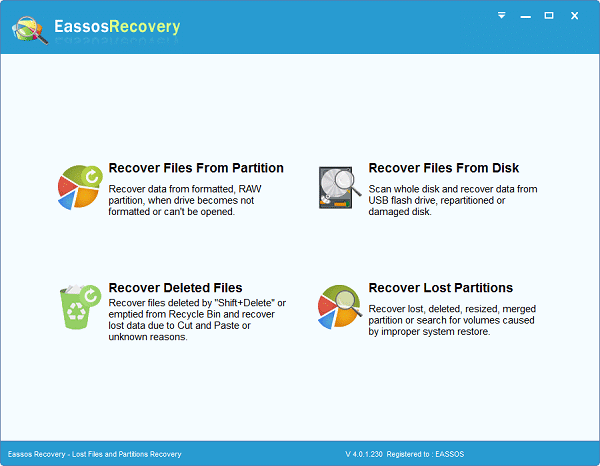 Install Eassos Recovery Free and start it. Click "Recover Deleted Files"
Select system partition which is usually drive C: and click Next to search for deleted data. Preview listed files and found out files you want to recovery. Select files by checking them and click "Recover" button to save them to a secure location. "Thankyou very much. The .net repair fixed my 2008 R2 server." "Windows Update encountered an unknown error - Code 80070643." "Parabéns pelas dicas, estava instalando um sistema da Volvo e estava dando este erro, montei uma virtual zero de XP, não deu certo, de Windows 7, não deu certo, ai li sua dica, show de bola. Funcionando perfeitamente. Obrigado e sucesso pela ajuda"
"when providing instructions for command prompt now (admin power shell} in windows it is correctly typed [sfc /SCANNOW] gives all possible scan methods, eg sfc /SCANNOW for repair. caps and spaces are critical in DOS"
" Error code 0x80070643 Rather than clicking on the windows update Try clicking on the windows defender icon on the system tray and open windows defender and then click on update - update definitions "
"how to fix error code 0x80070643"